This September during the Cannes boat show, Esenyacht gave Boat International a sneak preview of its latest innovation – an impressive augmented reality app that allows for a 3D view of a superyacht utilising a standard 2D image. While pouring over the general arrangements of the Turkish builder’s 50-metre sailing superyacht, Troy, Esenyacht’s General Manager Deniz Can said he’d like to demonstrate the new app the yard was developing. He held his iPad over the sheets of paper on the table, and before our eyes the 2D renderings came to life on the screen as 3D images. This included exterior views, 3D layouts and cut-aways, and by moving the tablet from side to side, we traveled along the yacht, and zooming took us inside and showed of deck details. The app also change the hull colour and show animations of tender bays opening. The Esenyacht augmented reality app has been developed in cooperation with Swedish agency 3D Interactive. It works by markers on the 2D images trigger 3D images on the screen, allowing traditional line drawings and renderings to come to life with only the use of the drawings on paper and a smart phone or tablet. With the augmented reality app, Esenyacht can bring its yacht designs to life and spontaneously take a viewer to any area of the yacht they want to explore in greater detail. More information can be added to the app over time, further enhancing the experience. 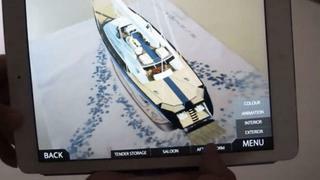 Esenyacht has prepared a short video showing its augmented reality superyacht app in use, which can be seen below. The app is now available free of charge in the iTunes and Google Play stores. To try out the app with Esenyacht, visit the builder at the upcoming Qatar International Boat Show this November.